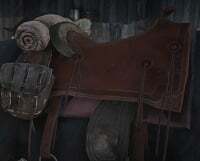 Horse Blankets are a Horse accessory in Red Dead Redemption 2 (RDR2). Purchased at Stables as part of Horse Tack, players can select different types for different prices, and unlock more by progressing through the game. Horse Blankets can be customized to different colors. Iron Cloud Blanket $9.50 ?? Nekoti Rock Blanket $8.75 ?? Rio Bravo Blanket $13.25 ? ?